An extremely beautiful blue and almost boundless expanse of water, Lake Tahoe actually measures around 22 miles / 35 km in length, and is some 12 miles / 19 km in width. Many small streams run into Lake Tahoe, although there is actually only one river flowing out of the lake - the Truckee River. Approximately two-thirds of the lake lies within the state of California, while the remain portion is located in the gaming state of Nevada, where many gaudy and glamorous casino resorts await. Surrounding by sandy, pristine beaches and coves, hiking trails around the Sierra Nevada mountains and along the Tahoe Rim Trail, and some truly tranquil places, the allure of Lake Tahoe in undeniable. 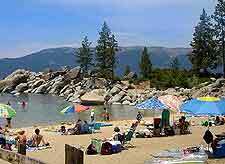 Tourist information is most readily available at the main towns, including the southerly town of South Lake Tahoe, and to the north, Tahoe City, Carnelian Bay, Kings Beach and the Incline Village. As well as hotels, Key West is home to a series of popular camping sites, many of which reside within surrounding parks, such as the Sugar Pine Point State Park, Squaw Valley and the Donner Memorial State Park. If you are looking for bargain accommodation, consider staying at one of the cheap hotels in South Lake Tahoe, where many chains line the US-50 Highway. Lake Tahoe vacation rentals can often be surprisingly affordable and include many highly appealing cabins, Swiss-style chalets and mountain homes, often close to the seasonal Alpine Meadows and Heavenly ski resorts. To properly explore Lake Tahoe, it is well worth enjoying a leisurely cruise onboard one of the numerous yachts, sailing boats or grand paddleboats, with the biggest cruise packages often including dinner and dancing. For views from a completely different perspective, hot-air balloon rides are on hand to whisk you high into the sky, although since an early start is likely and the cost is fairly prohibitive, many simply prefer a ride on the Heavenly Aerial Tram. The northerly Crystal Bay and Incline Village contain plenty of enticing casinos should you wish to try your luck, as does the town to Stateline, next to South Lake Tahoe. However, when the winter snow arrives, the lake soon becomes a winter's paradise, being surrounded by legendary ski resorts, such as the Heavenly Mountain Resort, Kirkwood, Mount Rose and Northstar. 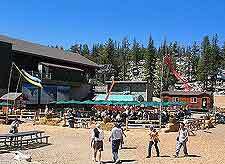 More information about Lake Tahoe Tourist Attractions and Lake Tahoe Ski Resorts. If you have your own transport, then exploring the shoreline becomes a breeze. As you drive around you will pass a number of impressive local landmarks and some superb vantage points. Do look out for the Chapel at Lake Tahoe, which is located at Tahoe City and has become a very popular place to get married. Within the Sugar Pine Point State Park, the sheer grandeur of the Hellman Ehrman Mansion is hard to beat, although the Vikingsholm Castle in South Lake Tahoe certainly gives it a run for its money. 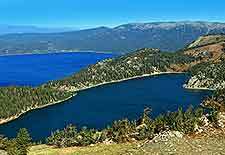 For endless views and the ultimate picnic spot on the Highway US-50, stop off at the Logan Shoals Vista Point, at Zephyr Cove, which overlooks Emerald Bay and Mount Tallac. More information about Lake Tahoe Landmarks and Monuments. Teeming with information about local Californian history, Native American Indians and regional Pioneers, the museums of Lake Tahoe are often of interest to tourists. 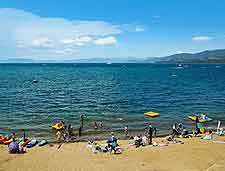 Located on the westerly shore and within the town of Homewood, most will enjoy a visit to the Tahoe Maritime Museum, while if you have children with you, then head to the Monster Museum at Kings Beach, where you will learn all about the mythical beast 'Tessie', who is believed to live beneath the water's surface. On a similar vain, the art galleries at Tahoe City, Incline Village and Stateline are also worth searching out, often containing large paintings created by local artists, who have successfully captured the local scenery with great skill. More information about Lake Tahoe Museums and Lake Tahoe Art Galleries. Wherever you choose to stay around Lake Tahoe, you will find yourself spending time traveling between the main sights and tourist attractions. 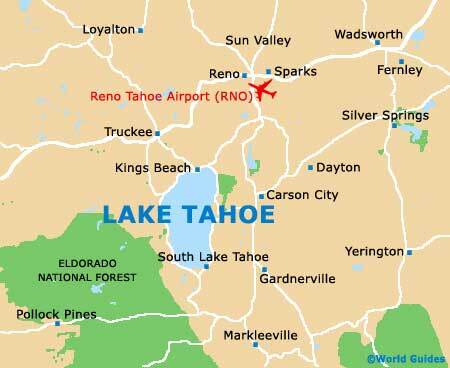 However, since much of Lake Tahoe actually lies within California, some rather famous neighboring cities may well prove just too inviting to resist. Head southwest and you will reach tourist hotspots such as the Wine Country of Napa Valley, the harbor city of Oakland, the state capital of Sacramento, and the iconic city of San Francisco, where the Golden Gate Bridge is just one of the many awaiting sights. 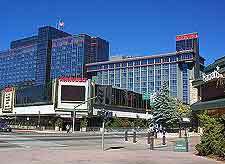 In Nevada, both Carson City and the glitzy city of Reno (a smaller version of Las Vegas) are to be found. 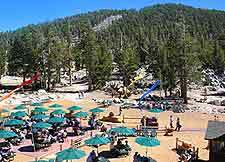 More information about Lake Tahoe Attractions Nearby.